The Jefferson Memorial in Washington, D.C., was dedicated by President Franklin D. Roosevelt 73 years ago today, on what would have been Thomas Jefferson’s 200th birthday. Located next to the Tidal Basin, the structure is now one of Washington’s most recognizable monuments—but at one time, many residents didn’t want it there at all. 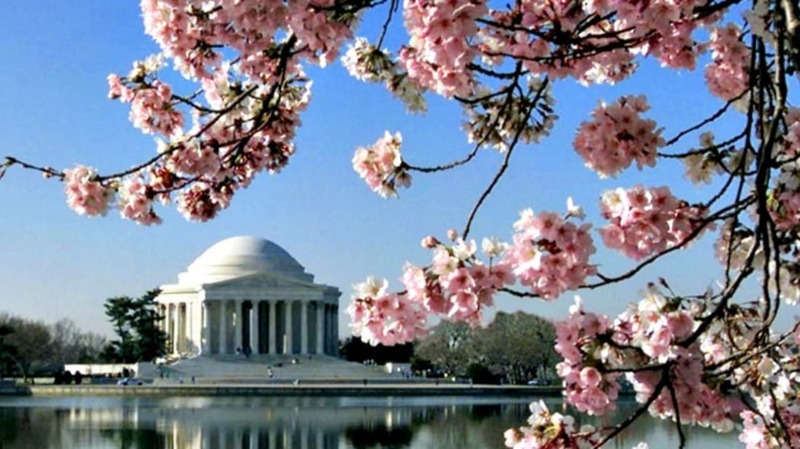 Find out why, along with other facts about the Jefferson Memorial. 1. THE PROPERTY WAS CREATED BY LANDFILL. 2. IT WAS ONCE THE SITE OF ONE OF WASHINGTON'S MOST POPULAR BEACHES. You certainly can’t swim in the Tidal Basin today, but it was once a summertime hotspot, featuring a diving platform and a cabana. At the time, it was also a "whites-only" facility. Congress originally approved funding for a similar swimming area for African-Americans, but after debate about the new spot intensified, the Tidal Basin was closed to everyone instead. Had the proposal been followed, the monument would have featured statues of these vague illustrious men. They would have been part of an entire compound that would have also included baths, a theater, a gymnasium, and other athletic facilities. Congress was apparently not interested in this idea, because the land went undeveloped for four decades after this proposal. 4. IT WAS ORIGINALLY A MEMORIAL TO THEODORE ROOSEVELT. After the beach closed in 1925, a competition was held for architects to design a memorial for the location that would honor Teddy Roosevelt. Architect John Russell Pope (who had lost the Lincoln Memorial competition in 1911) won with a design that included “two quarter-circle colonnades flanking a large circular basin, which was to contain a central island with an arrangement of a sculpture and a fountain,” according to the National Park Service. And that fountain? It was intended to be a 200-foot tall jet of water. But no government money was actually appropriated for the memorial, so nothing became of it. 5. FDR PERSONALLY REQUESTED A MONUMENT HONORING THOMAS JEFFERSON. In 1934, FDR personally contacted the Commission of Fine Arts about creating a memorial for Thomas Jefferson, whom Roosevelt admired. Another powerful figure pushing for the memorial? New York Congressman John J. Boylan, who campaigned for the creation of the Thomas Jefferson Memorial Commission, was appointed as chairman, and managed to get Congress to appropriate $3 million for the project. 6. THE LOCATION WAS A BIT CONTROVERSIAL. The site of the monument, just south of the White House, wasn’t a popular spot with everyone. Some thought the memorial was too grand for a man as humble as Jefferson, who didn’t include being president on the list of accomplishments he dictated for his tombstone. Putting the monument on the Tidal Basin, others argued, would call for the destruction of a number of fully grown elm and cherry trees. The Commission of Fine Arts was particularly opposed, arguing that the vista should be kept open as in Pierre L’Enfant’s original plans for the layout of Washington, D.C. In 1939, they even published and distributed a pamphlet denouncing the location and design of the monument. 7. ARCHITECT JOHN RUSSELL POPE WAS RESPONSIBLE FOR OTHER WELL-KNOWN WASHINGTON BUILDINGS. Pope had submitted the winning entry for the Theodore Roosevelt monument that never happened. This time, he was selected by the Thomas Jefferson Memorial Commission, which was likely impressed by a couple of other high-profile Washington projects he had worked on in recent years: the National Archives and Constitution Hall. 8. THE DESIGN WAS CHANGED AFTER POPE'S DEATH IN 1937. Pope's colleagues, Otto R. Eggers and David P. Higgins, revised Pope's original plans, which called for the Tidal Basin to be transformed into a series of reflecting pools and terraces. FDR approved the new design, which was decidedly more modest. When construction started on November 17, 1938, 50 women marched on the White House to protest the damage that was about to befall the famous cherry trees on the site, a gift from the mayor of Tokyo in 1912. The next day, some of them chained themselves to a tree at the construction site, an incident referred to as "The Cherry Tree Rebellion." Franklin D. Roosevelt himself was forced to get involved, calling the whole cherry tree controversy a "flimflam" drummed up by the press. Only 88 trees would be removed, he said, and hundreds more would be added. 10. JEFFERSON'S STATUE IS KEEPING ITS EYES ON THE LIKENESS OF ANOTHER FOUNDING FATHER. 11.THE BRONZE STATUE INSIDE IS 19 FEET TALL AND WEIGHS 10,000 POUNDS. When the statue was dedicated in 1943, Jefferson’s likeness was made of plaster due to wartime restrictions on metal. The permanent bronze was installed four years later. 12. ONE OF THE QUOTES INSCRIBED ON THE WALLS DIDN'T ACTUALLY BELONG TO JEFFERSON. The first part, “We hold these truths,” was Jefferson, though the words were edited for the sake of space—designers told the Jefferson Memorial Commission that they were constrained in the number of letters per quote. But the portion of the Declaration from “solemnly publish” through “divine providence” wasn’t written by Jefferson at all. According to historian Pauline Maier, most of that passage was written by Richard Henry Lee or by a committee of various Congressmen.